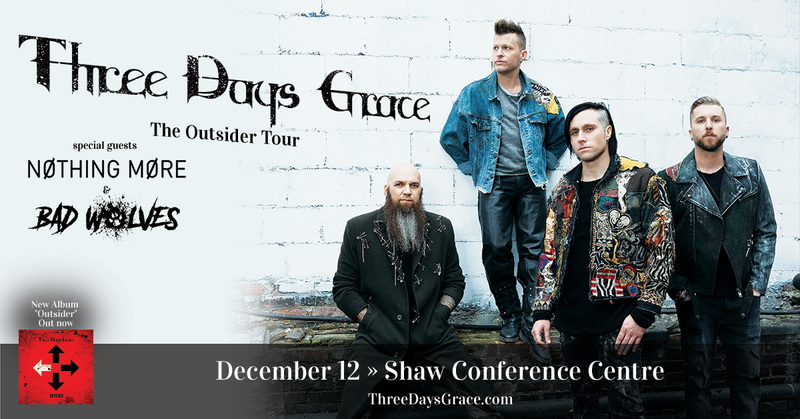 Whether you love the originals or new tunes, join Canadian rockers Three Days Grace as they head coast-to-coast in their native Canada with THE OUTSIDER TOUR in support of their sixth full-length album, Outsider. Presented by 100.3 The Bear, they’ll rock the roof off Edmonton’s downtown convention centre with special guests Nothing More and Bad Wolves. Since 2003, Three Days Grace has staked a spot amongst the hard rock vanguard, quietly breaking records, toppling charts, moving millions of units worldwide, and making history. The Ontario, Canada quartet—Matt Walst (lead vocals), Barry Stock (lead guitar), Brad Walst (bass), and Neil Sanderson (drums, percussion, keyboards, programming) – continue to blaze that trail on their sixth full-length album. “Infra-red” is the new single from Three Days Grace’s sixth studio album Outsider. The song is the follow up to their 14th #1 chart topping single “The Mountain,” also featured on Outsider. Three Days Grace continues to hold the all-time record for most #1 singles at the Active Rock radio format. Given this undeniable unpredictability, Outsider feels right at home alongside a catalog of fan favorites from Three Days Grace. Outsiders always leave enduring impressions. By veering away from the pack, these mavericks confidently lead the charge for others to follow. In the end, Outsider speaks directly to that army of fans around the globe. Tickets (incl. GST) $54.50 (plus service fees). Every pair of tickets purchased online will include a physical CD or digital download copy of OUTSIDER.